The City of Colwood calculates and prepares all property tax notices each year. Tax notices are issued near the end of May and tax payments are due on the first business day after July 1st. 2018 Tax Notices will be mailed to homeowners in May. If you don't receive your notice by May 26th, please call the Colwood Finance department at 250-294-8150. Claim your Home Owner Grant. Find Ways to Pay Taxes. Property taxation provides for city services and improvement projects. The property tax rate is set by Council each year. 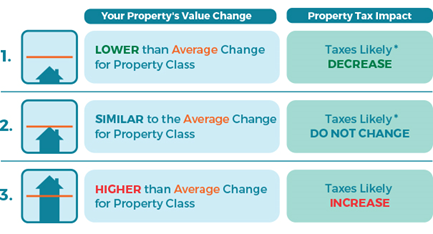 The tax rate, together with the assessed property value, determines the amount of property tax payable each year. See the 2018 Tax Rate Schedule (Mill Rates) [PDF] and check “Where your tax dollars go” for more information. 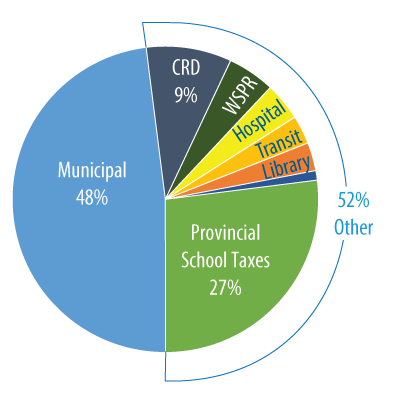 Less than half of the revenue from property taxes is controlled by the City of Colwood. Funds collected for other government agencies are simply passed on to them. This makes the system more efficient – residents receive a single tax notice rather than having each organization bill separately. Read more in the Property Tax Newsletter that was attached to your tax notice. 1% BC Assessment Authority and Municipal Finance Authority. The nearly $15 million that is retained by the City funds city services such as police and fire protection, street lighting, road and drainage maintenance, operating parks and recreational facilities, and planning and managing city developments and enhancements. The Colwood Financial Plan (2018-2022) outlines the City's goal of delivering a high level of service that strikes a balance between affordability for citizens and city-building initiatives that will improve quality of life while expanding our tax base.